This Chile Rubbed Pork Tenderloin with Maple Bourbon Sauce is one of my family’s favorite fall dinners. I often make it for our family holiday meals or special get togethers. It’s finally here. Today’s the day to reveal my entry for the Marx Foods and Foodie BlogRoll Iron Foodie Challenge. It’s time to face the judges and put my creation in their hands. After learning I was chosen for the Iron Foodie Challenge, I rushed home everyday to check the mailbox for the package from Marx Foods. What could it be? The arrival of the secret ingredients brought such excitement! Such … dilemma! What to cook? Sweet? Savory? Pastry? Spicy? I changed my mind with each ingredient I pulled from the box. Madagascar Bourbon Vanilla Beans… sweet! Smoked Sea Salt… savory! Maple Sugar… sweet! And so it went. Aji Panca Chiles… savory! Wait, they can be sweet. Should I combine the sweet and the savory for a real surprise? There were some challenges as well. 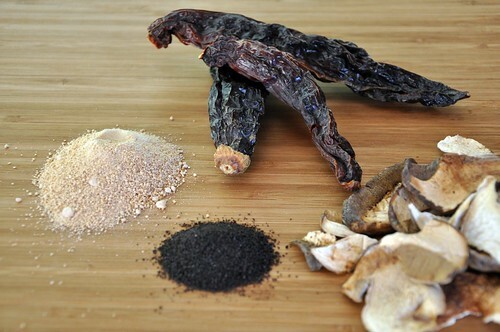 I worried Fennel Pollen, Dried Porcini Mushrooms, Tellicherry Peppercorns and Dulse Seaweed, how will I ever make these Southwest? That’s how the last few weeks have gone. Each day a new idea and each day a change of mind. 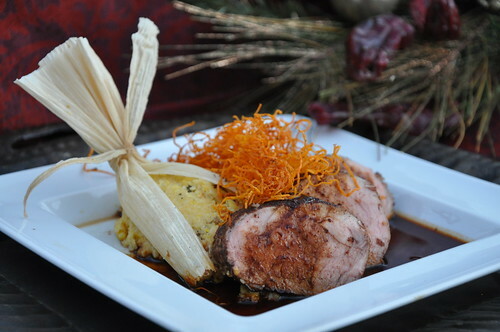 Aji Panca Chile Rubbed Pork Tenderloin with Aji Panca Bourbon Sauce, Porcini Mushroom “Tamale” and Sweet Potato Haystack. There! It’s a mouth full I know. I hope you like it as much as my family does. If you don’t, remember, this is my first contest so be gentle with me. The first thing to do is choose your weapons. My choices are aji panca chiles, porcini mushrooms, maple sugar and smoked sea salt, just for fun. Now, let’s get started. Nothing says Southwest like tamales. Unfortunately, the rumors you have heard about them are true. They are time consuming to make, very fattening and require a small army to assemble. That is unless you are making my polenta “tamales ” that are easy enough for everyday and not nearly as fattening as traditional tamales that are made with lard. 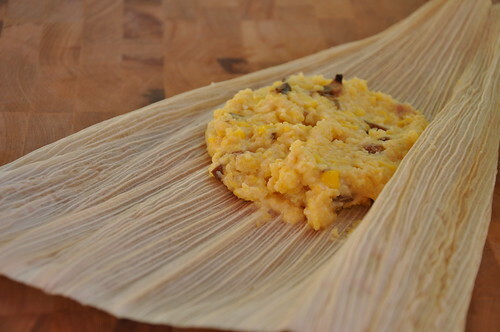 I’ve added Marx Foods dried porcini mushrooms and fresh roasted corn to polenta and steamed it in a corn husk to make my version of a quick and easy “tamale” that goes perfectly with the aji panca chile rubbed pork. Rinse dried cornhusks and soak in a large bowl of warm water until soft, about 30 minutes. Clean silks from corn and replace husks. Roast in 400° oven for 10 minutes. Remove kernels from cob, set aside. 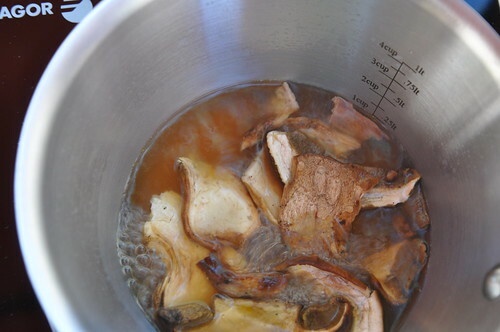 Reconstitute porcini mushrooms in 1 cup of chicken stock. Bring stock to a boil and simmer mushrooms for 20 minutes. Remove mushrooms from stock, dice. Set aside. Strain stock through a fine sieve and return to pan. Add remaining stock. Bring chicken stock to a boil and slowly add polenta while whisking. Reduce heat and cook over medium heat for three minutes. 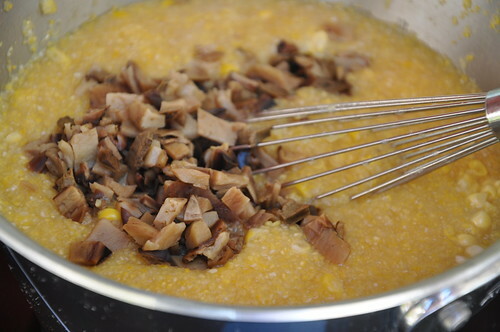 Stir in corn and porcini mushrooms. Remove from heat and let cool about 10 minutes. Stir in the cream. Drain cornhusks and pat dry. 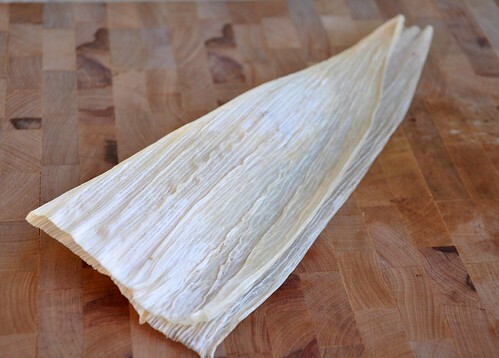 Tear one cornhusk into strips to tie tamales. Spread polenta filing on corn husks leaving 1 ½ inches uncovered on top and bottom and a little less than an inch on each side. Sprinkle with cotija cheese. 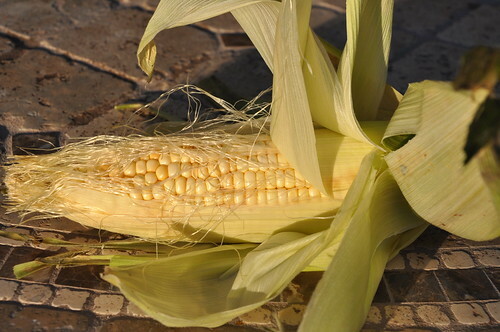 Bring sides of cornhusks together and fold over edges. 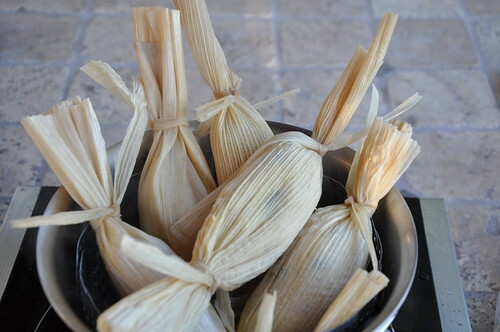 Roll the tamale. Twist ends and tie with strips of cornhusks. Set aside while making the rest of the dish or make them a day ahead and refrigerate them. Either way, steam them for 10 to 12 minutes just before serving. Fill bottom of a steamer or saucepan with a steamer basket with about one inch of water. Bring water to a boil and place tamales on the steamer basket. Cover the pan tightly and reduce heat. Steam over softly boiling water for 10 minutes or until tamales are warmed through. Add more boiling water to the pan as needed. Heat oil in a saucepan over medium high heat. Sauté the minced chilies, shallot and garlic for 2 to 3 minutes until chilies are soft. Do not brown garlic. Remove garlic from pan. Add bourbon to pan and stir to loosen chile and shallot from bottom of pan. Add chicken stock, spices, maple sugar, honey and balsamic vinegar. Bring sauce to a boil. Lower heat and simmer to reduce sauce by 1/2. Set aside to cool. Puree in a blender and strain through a fine sieve or coffee filter. Return to sauce pan. Remove stems and most of the seeds from 3 aji panca chilies. Grind aji panca chilies in a spice grinder until fine. In a small bowl, mix together ground chile, maple sugar, New Mexico red chile powder, cinnamon, allspice and nutmeg to make a spice rub. Trim silver skin from pork. Season with salt on all sides. Sprinkle evenly with spice rub. Tap off excess. Peel yams. Cut with a spiral slicer or finely julienne and divide into equal portions. Fill a saucepan halfway with oil. Heat to 375°. Quickly deep fry yams until crispy but not brown. Remove from oil and drain on a paper towel. Season immediately with smoked salt while yams are still hot. Cut one end off the warm tamale. 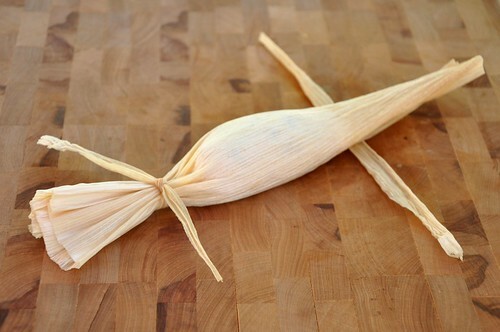 Make a slit in cornhusk so you can peel it back and fan cornhusk out around the tamale and place in center of plate. 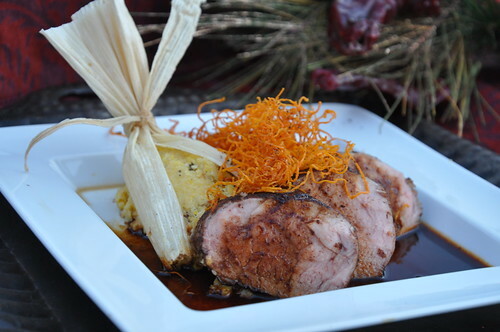 Slice pork into medallions and arrange them leaning on one side of tamale. Drizzle sauce over pork and plate. Top with sweet potato haystack and serve. I’ve really had a lot of fun coming up with my signature dish for the Iron Foodie Challenge. I do have to say that the dish does reflect a lot of “me” with a little sweet, a little savory, and a whole lot of Southwest. Remember, the voting begins on December 7. I’ll post a link that day so that you can check out the other challengers and vote for your favorite. In the mean time, if you have had enough turkey for a while, check out these great looking pork dishes by other bloggers. « Hurry! Only four days left to enter our birthday give away and win a KichenAid mixer! This is truly stunning! What an amazing job, Sandy – I know you are going to win!! Better yet, How about I come to YOUR house for dinner??? Oh my. This sounds amazing! I’m sure you are going to win! Frieda, Thanks for the vote of confidence! This is an amazing creation! I love the tamales with polenta and the Aji Panca Bourbon Sauce sound so flavorful with all the spices and maple sugar! The sweet potato haystack is a perfect finish, both visually and texturally. This is excellent! Thanks 5 Star Foodie! That means a lot to me, coming from you. I love your blog and 5 Star Foodie, Jr is doing great! I can’t wait to try this. Are aji panca chilies hard to find? The sweet potato haystacks are a wonderful idea: festive as a garnish or a side dish with any cuisine. Beautiful to look at, too. Love your beautiful pictures. Thanks, Mom! I haven’t looked around for these chiles, yet. But, I do like them. They have a nice flavor with very little heat. 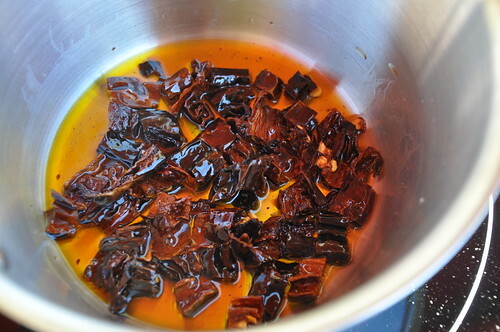 In fact, I will probably replace ancho chiles in a lot of my recipes with the aji panca chiles. I’m not a fan of lots of heat. Amber, thanks for the support. Please check back on Dec 7-10 and vote for me! Isn’t that shameless? Begging for votes! That looks so gorgeous! I love tamales, but yes, they can be very unkind to the waistline. Polenta is a great substitute that I’ll have to try someday. 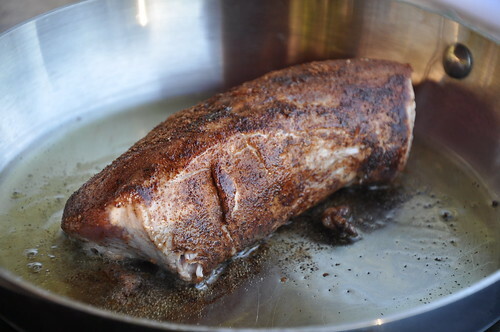 And pork tenderloin… YUM. Good luck! Moowiesqrd, Thanks! Your “Blasphemous” Guanciale Fennel Fried Rice looks amazing. Best of luck in the Iron Foodie Challenge and congratulations for having your photo accepted by Foodgawker! That is an accomplishment by itself! Wow, this is such a beautiful dish, your presentation is gorgeous! Thanks for participating and best of luck in the polls! Jenn, Thanks! It was really a lot of fun. I may have caught the contest bug. Thanks for hosting this challenge. Everyone’s entries look so amazing, it will be hard to pick just one. That’s a beautiful plate with a great balance of flavors. Fantastic! I am SO going to make this! This recipe looks wonderful and so creative! I love the short cut lower fat tamales. I am not a pork fan but this I would definitely eat. I can’t wait to try this incredible meal. You photos are fabulous, you have a natural talent in lighting, composition, & technique. You are very talented not only in creating recipes, cooking, and all that encompasses but photography too! Way to go Sandy!